Such a beautiful Iris! I ordered some Iris for the first time and they arrived in early September… it was still quite warm here in zone 8, but I planted them anyway, and guess what? My reblooming Harvest of Memories now has 4 flower buds on it, only 6 weeks after planting! WOW! Terrific! Thank you for sharing. We love hearing about how our Iris grow around the country. Thank you for choosing Schreiner’s Iris Gardens for your first trial with this lovely perennial. Kind regards! Gorgeous seedling! So frilly and cheerful! I started ordering Iris from you when I lived in New Hampshire. Iris Bores and rain caused a lot of grief. When we moved to New Mexico I dug up some of my favorites and hoped they would survive the sun and heat. They and the others I have bought since survived very well. Except Red Hawk. Mea Culpa – I planted it behind a tree in the side garden. Not enough sun. We have since cut down the tree. Our anniversary is May 21st and we have such splendor in the gardens. Have run out of room in the four gardens. But I lust after your splended new one. May have to turn my art studio into . . . Sadly my rebloomers never rebloom. Is there a trick to that? Sent 15 from my last order to my sister in Minnesota. One of them is not doing well so she potted it and brought her inside. Thank you for sharing your story. A testament to the hardiness of the Iris! As for rebloomers, some “tricks” include dividing more frequently (every 2 to 3 years, as opposed to 3 to 5 years), extra water in the summer months (bearded Iris typically require no or very little irrigation in the summer). Fertilizer once when the tulips are blooming in your area, and once again a month after Iris bloom season is complete. Let us know if you have any further questions. All the best! Dramatic distinctly beautiful Iris! White glowing petal and fall centers, with wide generous rich purple violet halo. The halo fairs inwards towards the eye catching, blue hued beards. The long white centers on the petals streak upwards, with joyful exuberance. Can’t wait to get one of these. i FORGOT TO KEEP A COPY OF THE NAME I SUBMITTED! WILL THIS BE A PROBLEM (IF I WIN) TO CLAIM THE PRIZE? Smiles. Thank you for your entry. We’ll be able to track you down if your entry is chosen. Kind regards! with the Iris I have ordered from Schreiners. Thank you for being so friendly and helpful when I have called to place an order. Thank you for the kind words, Connie. 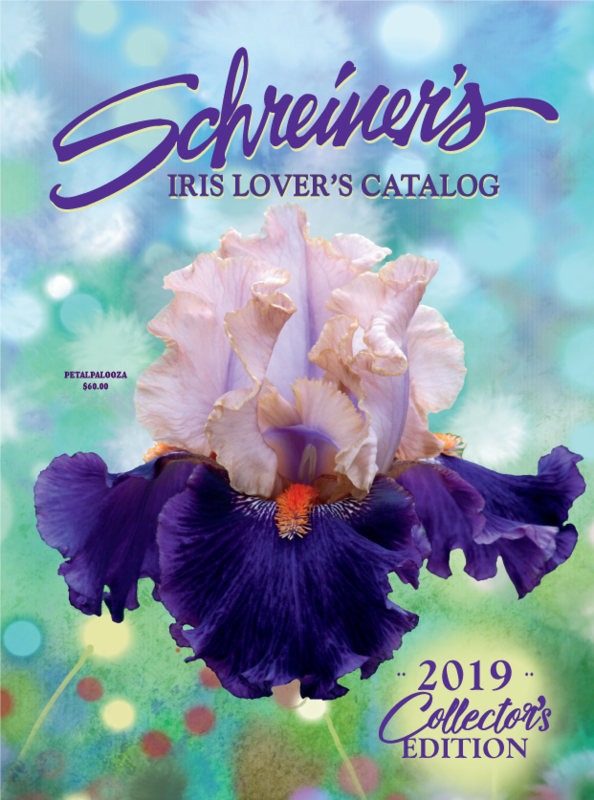 And thank you for choosing Schreiner’s Iris Gardens. With all of the wonderful options out there for gardeners these days, we recognize the challenge of choice. We appreciate each and every customer. Kind regards! In my iris-naming entry, the Schreiner site automatically entered my account I.D. rather than my name, and I clicked “Submit” without correcting it. Is this a problem? This should not be a problem. Thank you for the heads up, and thank you for participating in our contest. Kind regards!